Blizzard has announced new content strategy for the upcoming WoW Classic server(s). Blizzard continues to drip-feed us new information about the upcoming WoW Classic that will hit this summer. With the latest revelations about how content will be released we can at least rest assured that vanilla WoW is very much happening, despite the recent spate of bad news for the company. It’s an exciting time to be alive if you are a World of Warcraft (WoW) fan and Blizzard are going to make us quite happy cometh the hour. After a 2017 reveal of the official WoW Classic trailer, we all set our hopes high that 2018 may just be the year. As months filed out and no missives came, we began doubting Blizzard’s commitment, but then in November, 2018, Blizzcon arrived and with it the time window for the new game was announced. We’re all geared up for 2019 release for WoW vanilla, a game that will come with all the nostalgia and charm of its time, minus a few faulty aspects of the experience, and let’s face it – with loads of knowledge and preparedness on the part of the community. Recently, a WoW community manager fleshed out some details about the upcoming content release strategy. In 2018, Blizzard had said that four total patches would be released, but this changed with the recent announcement. 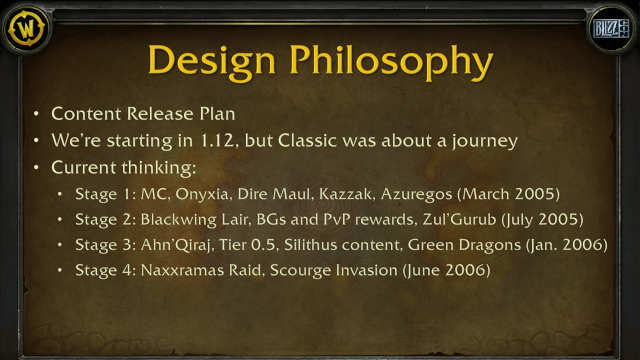 Instead, the content will come in six stages which was based on both community feedback as well as Blizzard’s own insight in the game. Blizzard will follow a very natural progression with patches, not letting any stronger items seep through the lower-tiers and have balance-altering consequences. Insofar as the release of specific dungeons and world challenges go, Blizzard will hold back with Dire Maul, Kazzak and Azuregos in order to ensure that players won’t be obtaining items that are disproportionate in power to the progress of the game. These content options are subject to future changes, although Blizzard and the community seem to have a good understanding and appreciation for the present content plan. The most experienced players – those who have been playing at private servers in he past ten years – will have no trouble blasting through the content. Reaching level 60 would take probably less than 70 hours to the most experienced games, although many people will be coming back for the community and nostalgic vibe. PvP content is notably missing from the list above. That’s because we’re still evaluating our options regarding PvP rewards, as they also changed over time (both in power and in terms of which PvP reward items were available). With WoW Classic now coming, there are quite a few questions pending. For example, what’s going to be the server’s maximum capacity – nobody knows. How many realms are there going to be? Still a bit of a mystery. If we sum up what we have seen from private servers these past few years, there were several realms with 7,000 – 10,000 players each. As a reference, WoW Classic had around 2,000 players back in the day. Perhaps 10 servers for starters will be a good estimate, although there is no way of knowing how regional servers will be divvied up. In most private servers, especially the ones which hit the impressive above-cited numbers, the population consisted of multi-lingual groups. With quite a few details left out, it’s very likely that the game won’t be released until late June, perhaps even August, although Blizzard would have to benefit from the fact that summer is a great time for the community to kick back with a beloved piece of entertainment so a timely launch would be for the best. Q: When Will WoW Classic Release Officially? The game is expected to launch in the Summer 2019. Q: Will Battlegrounds PvP Be Available? Battlegrounds will be added in the second phase of the content strategy. Q: Can I Play WoW Classic Beta? There has been no official information about a WoW Classic Beta, but there have been reports of leaked screenshots. Q: Is WoW Classic Much More Difficult Than the New Versions? If you are an experienced player, the game will have its clunkiness, but it won’t be so much difficult if you adapt yourself to the specific gameplay – which is slow and a little more challenging. Q: When are mounts avaialble in WoW Classic? You will get your first steed at level 40 in exchange for 100g, if no reputation discounts apply (they always do). Blizzard has revealed more details about their content strategy with the upcoming WoW Classic servers.